We’ve been having a think in the office lately about what makes the best golf courses and thought we’d try to pin it down to 10 top tips. Seemingly endless discussions have been had but we realised pretty quickly we can’t easily summarise several careers worth of experience. We tried anyway. As much as we claim that we, as golf course architects, are responsible for the feel of a new golf course, the truth is somewhat different. Can you imagine St Andrews without the coastline, sand dunes and old course hotel? Can you remember any of the holes at Pebble Beach without thinking of the cliffs and crashing waves? 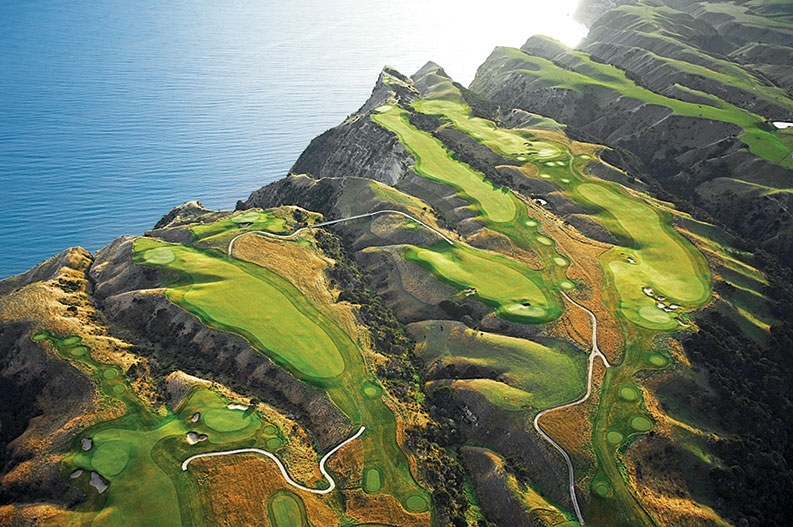 Would Cape Kidnappers be the same if it weren’t draped along the ridges above Hawkes Bay? One of the first things we see is the virgin site and it’s our job to bring the vision to life. Quite often, we’re asked to choose a site out of several possibilities or to help the owners expand a piece of land by expanding the site boundary to include certain features. Without exception, we would always advise owners to find interesting pieces of land with distinguishing features such as coastline, long views or rocky outcrops. One of the more enjoyable would be the inclusion of some old military bunkers from the time of the Cuban Revolution. It gives a real story to the golf course and a sense of place like no other. 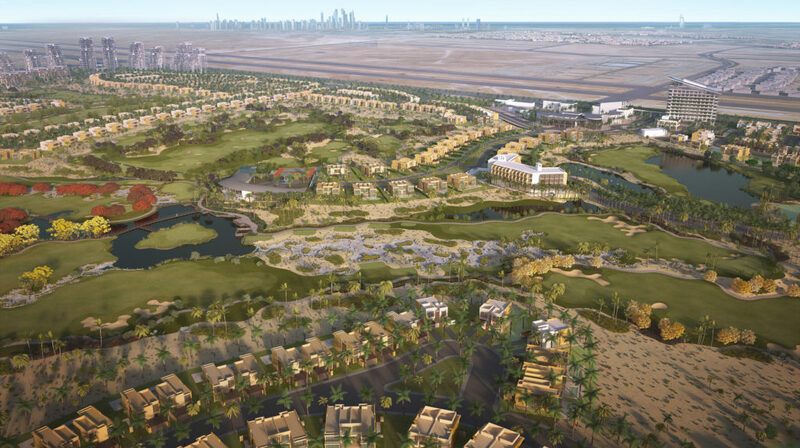 As an industry, we’re improving sustainability across all aspects of golf development with programmes like Audubon being more widely adopted by new golf courses. Top of the checklist for appraising any golf course site is the resources available to it, especially water. Golf courses can use up to 5,000 cubic metres of water every day in the worst case, hottest, driest day. One of the most critical factors in people’s perception of a golf course is the quality of the turf. Without enough water, turf will dry out and it’s resistance to disease will decrease hugely. Maintenance spend will increase exponentially and the business will become unsustainable. So, before we’ve even picked up a drawing pen (or clicked a mouse button), we’re looking at factors way beyond our control. Now let’s have a look at what is under our control as golf course architects. The vast majority of our work is on golf & residential developments so to the developer, the golf course layout is critical to ensure maximum premium frontage is available to add value to the onlooking properties. However, to the player, it’s important not to feel overlooked which, to the inexperienced, can be quite tricky to achieve. We usually aim, at a minimum, for two returning loops of 9 holes with halfway houses at the two extremes of the loops. Working predominantly for real estate developers, it can be tricky to persuade them of the requirement for a decent golf driving range, putting greens and short game areas. They take up a lot of land, which is inevitably equated to number of residential units which could have been sold. As a company, we understand this requirement. However, if there are no other practice facilities in the area and especially if the golf course serving a client base that is relatively new to golf, a decent driving range is essential. In fact, it would be very tough to justify bringing any international tournaments to a course without a driving range. 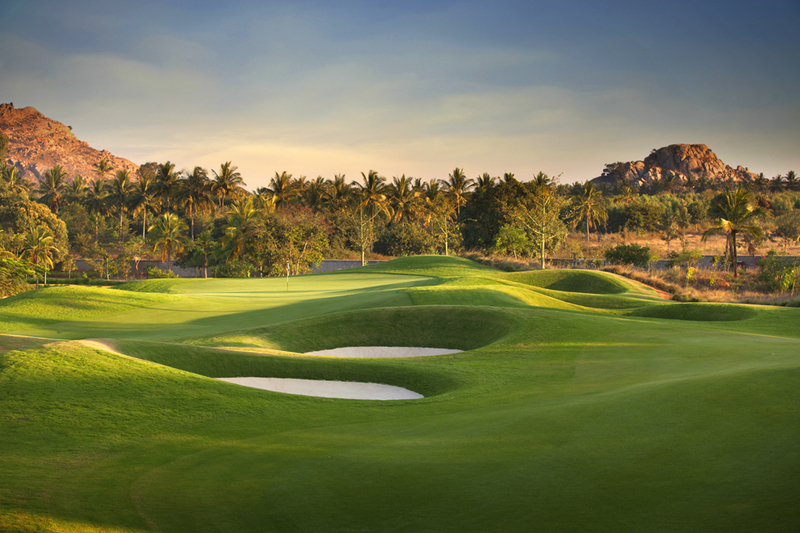 On some of our recent golf course design work in India, we are designing 9 hole short courses that can be shut and operated as driving ranges for a portion of the day. One of the many clever ways of squeezing golf into a smaller space. 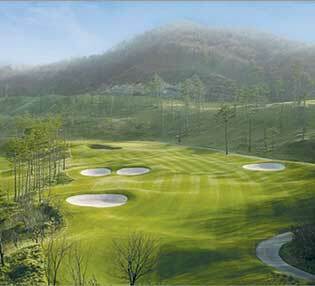 Different developers have different requirements but the most common is an 18 hole, 7,000 Yard, Par 72. This is generally accepted worldwide as the minimum definition of a championship length course. Typically, this would fit on a 60 Hectare piece of land but this can vary depending on many different factors. 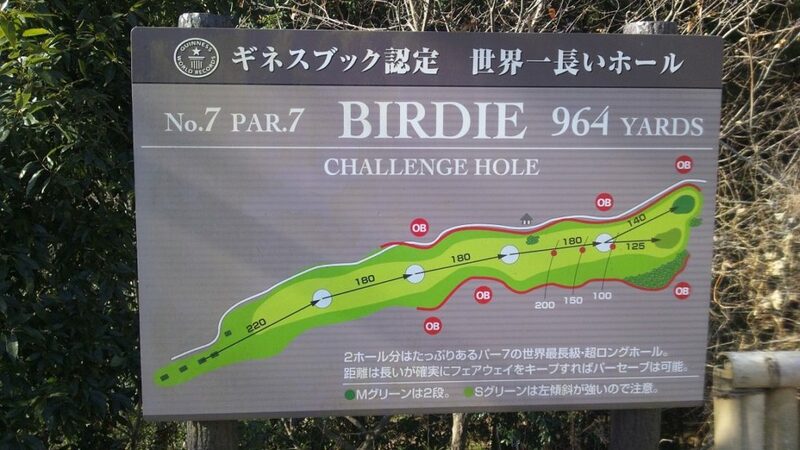 Personally, I think this is the upper limit of a fun and involving golf course. Often we’re asked to increase the length past this, sometimes to over 7,500 yards. Whilst this may be an interesting headline for potential guests, the reality is it becomes a slog out on the course. It artificially favours the big hitters which isn’t exactly fair. I for one, would far rather play a shorter course where playing strategy is more important than overall length. Look at the 10th on the Brabazon course at the Belfry for example. A classic risk-reward hole if you’re intending to hit the green in one. The shorter hitters will lay up on the fairway opposite the narrow green. The strategists might choose to play shorter off the tee to get a full wedge into a longer green. That’s what I look for in a golf course, not the overall length. Accuracy, Carry then Length – in that order. Safety issues are something I never thought about before I became involved in the industry. Now we see them in every country across the world. Squeezing a golf course to gain a few extra property plots is a classic move but it can have some dangerous side effects. We often act as expert witnesses in courtrooms across the world and see some of the very worst injuries. It’s one of the reasons that specialist golf insurance exists and the industry is growing. When a golfer steps on to a golf course, he or she accepts a level of risk. However, this risk should be reasonable. Everything we do in planning the routing, the boundary conditions and the layout of the course features is internally audited for the safety of the players and the safety of any surrounding property. We’re proud to be the authors of one of the few golf course safety guidelines available. This is a huge topic but I’ll try to keep it brief. There are lots of different types of golf hole layout but we’ll concentrate on the three most common classifications. Penal, Heroic and Strategic. Penal holes tend to have a forced carry or obstacle directly in front of the landing zone. There is no choice but to go for it, which is not so popular these days but can be quite a buzz when your on form. Heroic holes give an option to take on a hazard to gain a competitive advantage such as an open green or a single shot approach on a par 5. The important thing about the heroic hole is that those who chose not to be heroes still have a chance of playing without being overly penalised. Strategic holes level the playing field. These holes always have more than one plausible route into the green and favour accuracy over shot length. A long tee shot may have to contend with a series of approach bunkers whereas a shorter lay-up may be rewarded with a more open green but a longer approach. I would argue that most golf holes designed by a bona fide golf course architect are strategic to an extent although you do occasionally find a completely empty golf hole, devoid of any significant hazards. The textbooks will tell you this is a ‘breather’ in readiness for a particularly difficult hole. I generally try to avoid this. It seems like an excuse for a lack of inspiration to me. There’s a reasonably well known quote about putting “Half of golf is fun; the other half is putting”. It can be the most frustrating part of the game which is why it’s so crucial to get the design of the greens just right. To an extent, the level of difficulty can be tweaked with mowing heights but the reality is, it must be right first time. We must ensure the greens are interesting, subtle and fun whilst retaining 75% pinnable area, good drainage and ideal conditions for perfect turf. The shape and location of the greens aren’t isolated rather they are intricately balanced with the rest of that hole. 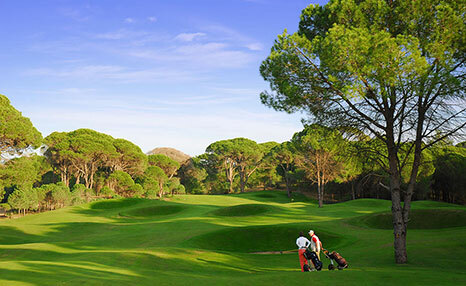 In addition, a good balance and rhythm of greens should be experienced throughout the round. 9. Get the Level of Difficulty Right. One of the absolute worst things about playing some of the more difficult courses around the world is being hurried through your round. Nothing is more annoying and it’s happening more and more. In my view, caddies asking a regular golfer to speed up is tantamount to the club admitting that their golf course is just too difficult. It’s been designed badly. When we design a course, we make sure that the level of difficulty matches the guest’s requirement. 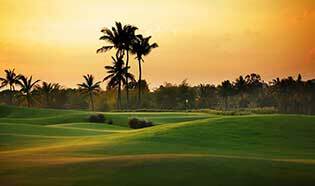 For example, a resort course in Cuba where infrequent golfers may play once or twice a week needs to be relatively easy to play. Of course, it still needs a fair challenge but the game should flow nicely, limiting bottlenecks and overly lengthy searches for lost balls. One example of speeding up play is to have an offset forward tee. On many resort courses, different standards of golfer will play together. With an offset forward tee, the weaker golfers can tee up at the same time as those on the daily tees. The golfers haven’t been hurried but we have a measurable increase in the speed of play. On the flip-side, some of the more prestigious courses we have designed have been amongst the most difficult on that continent. It’s all a balance. The design of the course needs to be matched to the expected clientele. Building golf courses doesn’t have to be overly expensive. A lot depends on the site, it’s proximity to building materials, the geology and availability of water. Some of our favourite golf courses have been the less expensive ones but the biggest mistake we can make as designers is to build in large maintenance budgets. Steep or complex bunker faces can look amazing but aren’t well received by the superintendents. Complex softscape planting takes countless hours of labour away from the real job of creating perfect turfgrass. 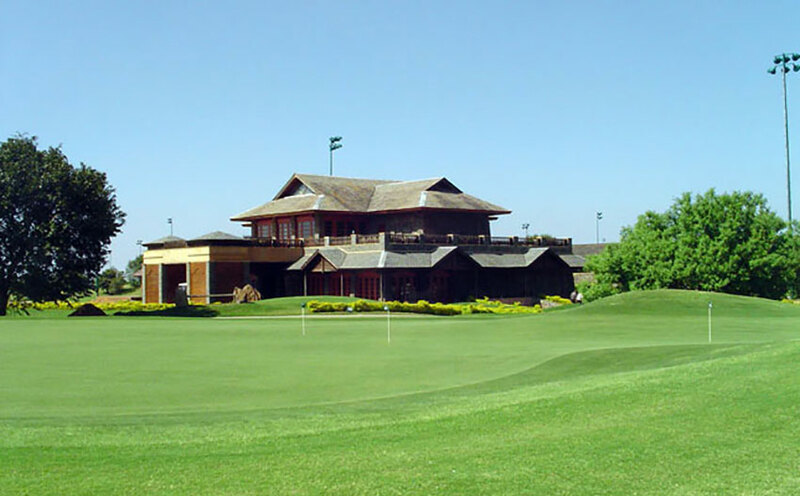 A well-designed golf course has to be financially viable both in terms of cap ex and ongoing maintenance. If you’re planning a golf development or perhaps you have a piece of land that is crying out for attention, give us a call anytime and we can advise and help with all aspects of golf course and golf resort design.